With masses of golden yellow flowers from winter into spring, Acacia lasiocarpa comes in two forms and it is the prostrate form that is most widely used in landscaping. Over time it will form a dense ground cover and when in full flower you are presented with a carpet of golden yellow for weeks on end. 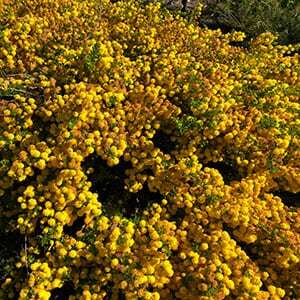 You will need a well drained soil and a sunny position to grow Acacia lasiocarpa. It will grow in a little afternoon shade, however not deep shade. This is not a species that grows well in humid climates or tropical areas. Its natural habitat is in sandy coastal areas of southern Eastern Australia. It is best planted where it will not be in competition with taller growing species. Usually from seed that will need to be scarified to promote germination. Height – To around 30cm for prostrate variety. Flowers – Golden yellow balls.